A letter is circulating among Google employees that calls for the creation of an “ethics review structure” that includes representatives from rank-and-file workers. This comes after news leaked that Google planned to build a search engine that censored information in an effort to comply with China’s communist government and begin once again operating there. Sources who spoke to Business Insider say that part of the problem is that Google’s managers have yet to address the plan to re-enter China, and the associated ethical quandaries, with employees. Google faces yet another showdown with employees following news reports earlier this month that the company wants to offer a search engine in China – one that would censor information in accordance with governmental requirements. A letter is circulating among Google’s staff that calls for the creation of an “ethics review structure,” which would make ethical assessments of the company’s projects. Representatives chosen by the staff and “ombudspeople” would take part in those assessments, according to the letter. The letter also calls for a “Code Yellow” at Google – internal lingo for a serious situation that bears immediate attention. The news that Google was building a censored search engine, as part of an effort –codenamed Project Dragonfly– to once again operate in China, first broke in The Intercept on August 1. Google pulled its search engine from China in 2010 after refusing to filter out web sites and information that the Chinese government found objectionable. This kind of censorship is widely regarded as a human rights violation. When Google cofounder Sergey Brin explained the reasoning for the move said management objected to the “forces of totalitarianism,” in China. Some Google employees would like to hear Brin and cofounder Larry Page explain, but management has said nothing. It has not gone unnoticed by employees that Google’s leaders have yet to address the censored search-engine reports internally, two weeks after the news first came out. This contrasts with the much more immediate internal response when news leaked that Google was providing artificial intelligence tools to the military. Last year, word began to spread inside Google that the company had helped the Pentagon analyse drove video-footage using AI. In that case, Google Cloud CEO Diane Greene took to the company’s internal communications tools within 24 hours of the leak to inform staff what was going on and the company’s position. In that case, more than 4,000 Google employees signed a letter addressed to CEO Sundar Pichai that demanded Google never make AI-enhanced weapons. 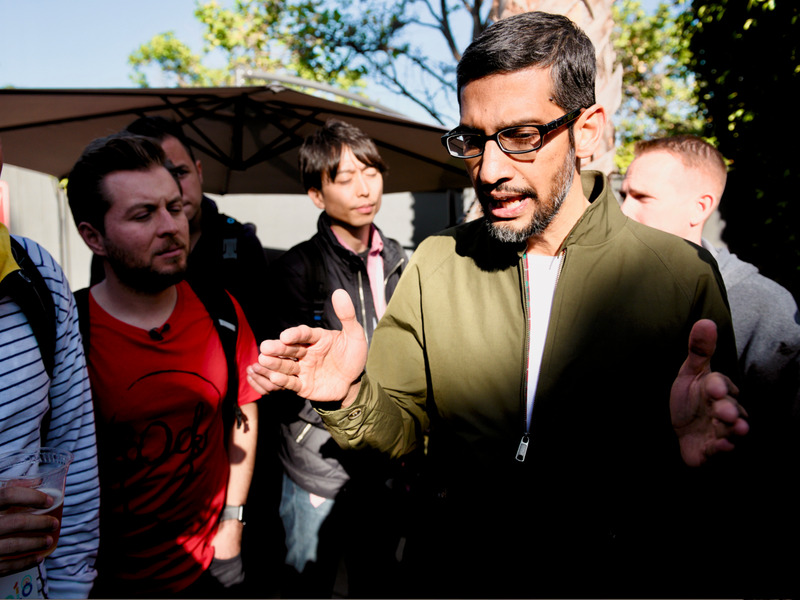 Pichai responded by releasing a set of principles designed to govern the company’s future decisions on AI. The principles included never creating AI weapons or using AI to harm. On Thursday, Google spokespeople suggested that the lack of response from Google’s leaders was due to summer vacations, but that stance doesn’t appear to have convinced the workers who signed the letter. To make ethical choices, Googlers need to know what we’re building. Right now we don’t. So we, the undersigned, are calling for a Code Yellow on Ethics & Transparency at Google. Our industry has entered a new era of ethical responsibility: the choices we make matter on a global scale. Yet most of us only learned about project Dragonfly through news reports early August. Dragonfly is reported to be an effort to provide Search and personalised mobile news to China, in compliance with Chinese government censorship and surveillance requirements. Eight years ago, as Google pulled censored web search out of China, Sergey Brin explained the decision, saying: “in some aspects of [government] policy, particularly with respect to censorship, with respect to surveillance of dissidents, I see some earmarks of totalitarianism.” Dragonfly and Google’s return to China raise urgent moral and ethical issues, the substance of which we are discussing elsewhere. Here, we address an underlying structural problem: currently we do not have the information required to make ethically-informed decisions about our work, our projects, and our employment. That the decision to build Dragonfly was made in secret, and progressed even with the AI Principles in place makes clear that the Principles alone are not enough. We urgently need more transparency, a seat at the table, and a commitment to clear and open processes: Google employees need to know what we’re building. 4. the publication of “ethical test cases”; an ethical assessment of Dragonfly, Maven, and Airgap GCP with respect to the AI Principles; and regular, official internally visible communications and assessments regarding any new areas of substantial ethical concern.